Solid hardwood cabinet of beautiful design and high quality construction. A glass door keeps your special jersey pristine and dust free! 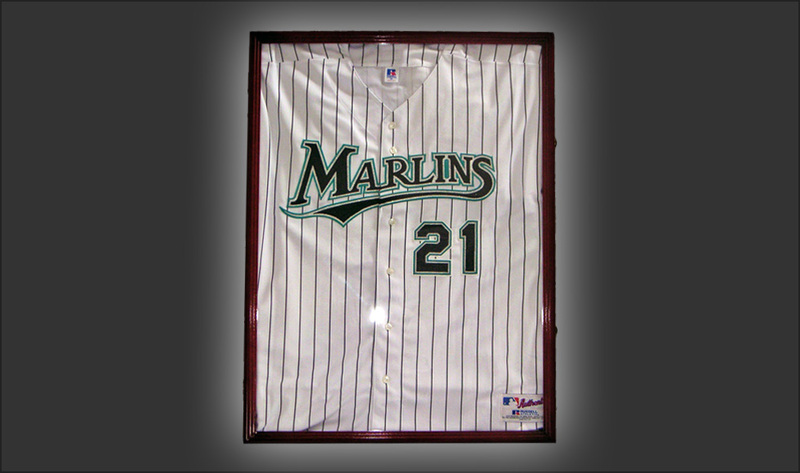 A great way to display an autographed or memorabilia baseball jersey. Dark green felt backing helps to create a stunning display. This unique baseball jersey cabinet holds a large jersey and can be displayed front or back. Brass hinges and door latches. Cabinet comes ready to be mounted to your wall. You won’t find a better made or better looking bat display case on the market anywhere. Available in cherry, walnut, oak and black finishes.